They're evil, they're unnatural and they've taken captives. They need to be stopped. The only trouble is, when you slay these monsters... Sometimes They Come Back. In this adventure, player characters go up against a butcher priest and his army of undead to save innocent lives. To succeed, they must risk not only their lives, but their very souls. 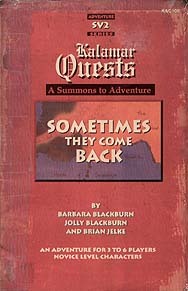 The Sometimes They Come Back Kalamar Quest adventure and supplement is designed to provide both a challenging adventure and useful supplementary campaign material. The material within is set in the popular kingdoms of Kalamar fantasy campaign setting but can easily be used with any fantasy role-playing game setting. This game adventure and supplement is suitable for use with any fantasy role-playing system, including but not limited to Advanced Dungeons & Dragons, Rolemaster and Hackmaster.